and more! 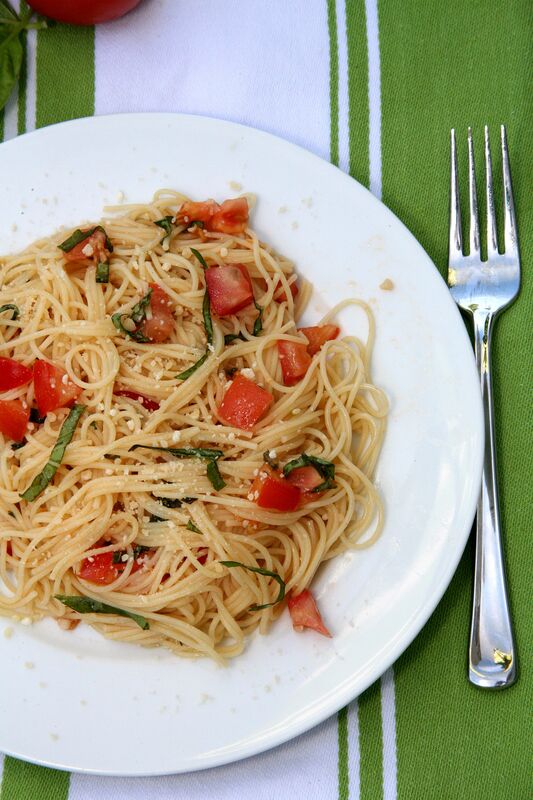 It was a little tricky to decide on a title for this dish, because if I were to explain it completely it’s pasta tossed in olive oil with fresh tomatoes, basil, garlic and parsley! Luckily, the long name is the most difficult part of this perfect Summer lunch or dinner! It’s a very light dish and can be customized quite easily. Sometimes we add sauteed mushrooms to the mix or include strips of grilled chicken for a more filling meal. Other suggestions? I like the idea of slightly modifying it each time I make it to find great new combinations! This is a go to meal for me especially on Summer days where we find ourselves short on time; you can make this meal in 20 minutes! If you’re lucky enough to have a garden in your back yard the fresh picked tomatoes and basil would guarantee amazing flavor! I would love to have a garden of my own or even an earth box on our deck for some fresh vegetables; do I still have time this Summer? The flavor is just so much greater. My grandmother has a lovely garden and I look forward to the fresh veggies every year, especially her cucumbers…what a world of difference from the store bought produce! If you don’t have a garden, the Farmer’s Market is a great place to shop this time of year too! Finely chop your tomatoes, basil, parsley and garlic; add to a large mixing bowl. Pour in olive oil and stir to mix the ingredients together. Bring a large pot of water to a boil. Add pasta and cook as directed. Drain pasta and toss it in the mixing bowl of raw sauce. Makes 6 servings, transfer to plates and garnish with cheese.